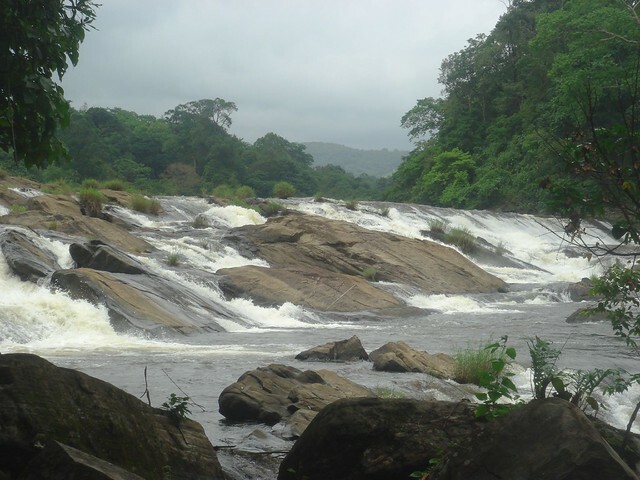 Just about 5 KMs upstream from the Athirapally Falls, the Vazhachal falls are on the Chalakudy River near the Vazhachal Forest Division. Both these falls are just 2 hours’ drive from Ernakulam. Unlike Athirapally Falls, Vazhachal falls are a series of massive rapids for a good length of the river. Water is quite shallow here and people do enter the water even when it is not allowed to swim here. Vazhachal falls are a short walk from entrance so people of all age can come up to the falls. The forest department has maintained the area well with a park and a pathway with railings alongside the river so that visitors can get a good view of the rapids. One needs to get an entry pass from the Kerala Forest and Wildlife Department to visit the falls. The ticket purchased for entry to Athirapally falls is also valid for Vazhachal falls.